With the start of the 2017 Monster Energy NASCAR Cup Series season just one day away, the sanctioning body is making sweeping changes to its inspection and deterrence model for rules enforcement in the Cup garage. Thursday at 4 p.m. NASCAR announced a series of rules changes with regards to at-track inspections. The bottom line is that starting immediately, NASCAR is going to attempt to handle penalties at the track when offenses occur, rather than waiting until the middle of the following week to deal with them. Race weekend penalties could include such items as “Radiator, exhaust headers, sway bars, shock absorbers, truck arms, hubs, pinion angle shims, fail inspection two or more times, bump stops,” said NASCAR’s memo. Safety penalties, such as loss of ballast or missing lug nuts will be handled on a case-by-case basis. In addition, the old P1-P6 penalty system is gone. Now there are just two penalty tiers. A Level 1 infraction — for things like having 17 or fewer lug nuts or failing to meet minimum weight — will carry a 10- to 40-point penalty, a one-to-three week suspension and a fine of $25,000 to $75,000. A Level 2 penalty for things that traction control or illegal fuel additives or testing would up the ante to 75 points, a six-week suspension and fines of $100,000 to $200,000. The at-track inspection procedure is changing, too. From now on, there will be three inspections: A weekend-opening inspection that covers only fuel systems, engines and safety equipment, followed by pre-qualifying and pre-race inspections. 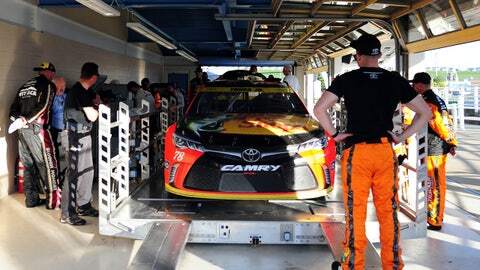 Per NASCAR, “Pre-qualifying and pre-race will consist of a full inspection – fuel systems, engines, safety components, chassis, templates, and weights and measurements.” And if a car flunks any of the inspection stations, it has to go back to the garage and repeat every single part of the inspection. It should make for an interesting start to Daytona Speedweeks, which begin Friday with two practices for the Advance Auto Parts Clash, the first from 5-5:55 p.m. ET, with Happy Hour from 6:30-7:25 p.m. Both practices will be televised live on FS1.